A fast, versatile HPLC column packing material, Hamilton PRP-X300 columns rapidly and easily separate closely related alcohols and organic acids without column heating. The sulfonated poly(styrene-divinylbenzene) support separates samples by a mixed mode mechanism. 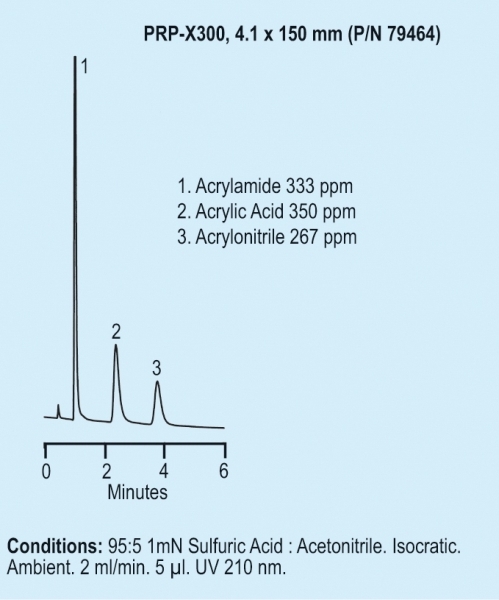 A wide range of samples can be analyzed with PRP-X300 columns because the selectivity of the column can be altered by changing the pH of the buffer or adding an organic modifier (Methanol, Acetonitrile) to the buffer. The supports stability to organic solvents makes it possible to analyze samples that have been too highly retained on conventional ion exclusion supports. The use of isocratic conditions allows samples to be analyzed without column reequilibration.